During his State of the Union address on Tuesday, President Trump offered a defense of two recent and controversial foreign-policy decisions: His attempt to pull U.S. troops out of Syria and the administration’s peace talks with the Taliban, which could lead to a U.S. withdrawal from Afghanistan. “Great nations do not fight endless wars,” he said. Yet, Trump glossed over Iraq, another country where the United States is fighting a seemingly endless war. Nearly 16 years after the United States invaded Iraq, there remain about 5,200 U.S. troops stationed there. When Trump visited them in December, in his first trip to a conflict zone as commander in chief — and shortly after his unexpected announcement that he planned to withdraw troops from Syria — it was seen as a reinforcement of the U.S. mission in Iraq. Trump confirmed no immediate plans to withdraw from Iraq. “In fact, we could use this as the base if we wanted to do something in Syria,” he said during his stopover. But while the president and his national security team may want U.S. troops to stay, his words and actions seem to be decreasing the country’s tolerance for hosting American forces. That point was highlighted this week after Trump suggested the U.S. presence in Iraq could be used to “watch” Iran. “We might as well keep it. And one of the reasons I want to keep it is because I want to be looking a little bit at Iran, because Iran is a real problem,” Trump said in an interview with CBS on Sunday. As The Post’s Tamer El-Ghobashy and Mustafa Salim reported Monday, Iraqi President Barham Salih rejected the idea outright. “We will not allow this,” he said. “Iraq does not want to be a party or axis to any conflict between multiple countries.” The Iraqi president, whose office is mostly symbolic, added that American forces were allowed into the country only to fight terrorism. The next day, Prime Minister Adel Abdul-Mahdi offered his own pushback. “When it is said that the mission of these [U.S. forces] is to fight a neighboring country, like Iran, for example, we reject that notion. The constitution itself prevents us from such approaches,” he said, according to the Iraqi Kurdish news site Rudaw. Although the United States had an extensive military presence in Iraq for years following its invasion in 2003 — troop levels peaked at more than 170,000 in 2007 — the Obama administration withdrew U.S. forces after the United States and Iraq failed to reach an agreement that would govern American deployments. The last U.S. units left in December 2011. However, after the Islamic State spread across Syria and Iraq, seizing large areas of northern Iraq in 2014, Baghdad turned to Washington for help. U.S. forces returned, but strictly for anti-terrorism purposes — a fact U.S. officials have acknowledged. “Our military mission on the ground remains very focused on the reason that the government of Iraq asked us to come there,” U.S. Army Gen. Joseph Votel, head of U.S. Central Command, said during a Senate Armed Services Committee hearing on Tuesday. The two nations have not signed a new Status of Forces Agreement outlining the terms of the U.S. presence, meaning American troops are in Iraq only at Baghdad’s request. For Trump, U.S. bases in Iraq may seem like a logical place from which to watch or counter Iran. The administration’s Iran policy is, after all, focused on containing a country that is “a source of potential danger and conflict,” as Trump said. But the Iraqi government’s calculations are more complicated. In general, Iraq’s new government has tried to avoid being in the middle of a tussle between Washington and Tehran, its much more powerful neighbor. Abdul-Mahdi, the new prime minister, is viewed as willing to seek compromise; he is backed by Shiite politicians led by populist cleric Moqtada al-Sadr, a critic of both the United States and Iran. In painting Iraq as an American listening post, Trump has done his cause few favors. Writing for Defense One, Katie Bo Williams outlined how the president’s words played into Baghdad’s parliamentary politics. “Trump’s remarks come as a variety of anti-U. S. political blocs are urging the parliament to vote on legislation that would curtail American military activities in Iraq — or even oust U.S. troops entirely,” Williams wrote. Worse still was Trump’s failure to meet Abdul-Mahdi when the president visited Iraq in December, in a break from his predecessors. 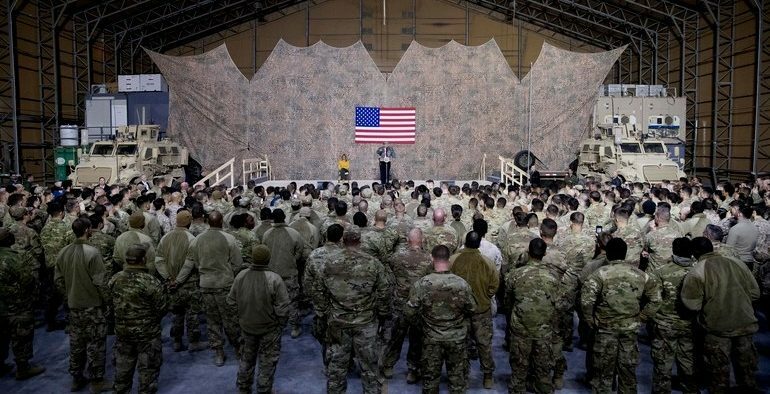 “Visiting a military base in Iraq and not meeting any Iraqi officials is a good way to increase the risks that we don’t have much of a military presence at all in Iraq for very long,” a senior official in the anti-Islamic State coalition told The Washington Post at the time. If Iraq ejects U.S. troops, how would Trump react? It’s tempting to say he would not care. Trump has long been a critic of what he calls “endless wars” and U.S. military deployments. “I think we should have gotten out a long time ago,” he said during an interview with CNBC in August 2011, months before the Obama administration completed its withdrawal from Iraq. However, it seems more probable that the Trump administration is finding out, as it did in Syria, that its numerous Middle East foreign-policy goals — limiting the U.S. presence abroad, fighting the Islamic State, containing Iran — often do not align. This article was written by Adam Taylor from The Washington Post and was legally licensed through the NewsCred publisher network. Please direct all licensing questions to legal@newscred.com.